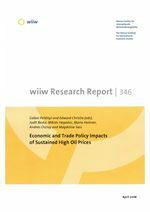 This study provides an overview of the most important economic and trade policy impacts of high oil prices in the European Union. The potential reasons for recent oil price increases are briefly discussed, followed by a review of the macroeconomic effects of higher oil prices, namely on growth, inflation and trade balances. Industry-specific effects are then assessed, offering both a historic perspective and descriptive elements regarding possible future developments. Price effects are also assessed, covering final energy product prices, industrial commodity prices and agricultural and food prices. The study then presents the main responses of economic agents to higher energy prices, with a particular focus on corporate supply chains, production relocations, fuel substitution efforts and energy efficiency measures. Finally, the potential for appropriate policy responses at the Community level is discussed, notably with respect to available trade policy and external policy instruments.